I’ve got souls, and I know how to use them. The isometric dungeon crawler is a genre that I could never tire of. From PC to consoles to handhelds, I’ve played everything from Baldur’s Gate to Diablo, Path of Exile, Untold Legends, Divinity: Original Sin, to the excellent Vikings: Wolves of Midgard. 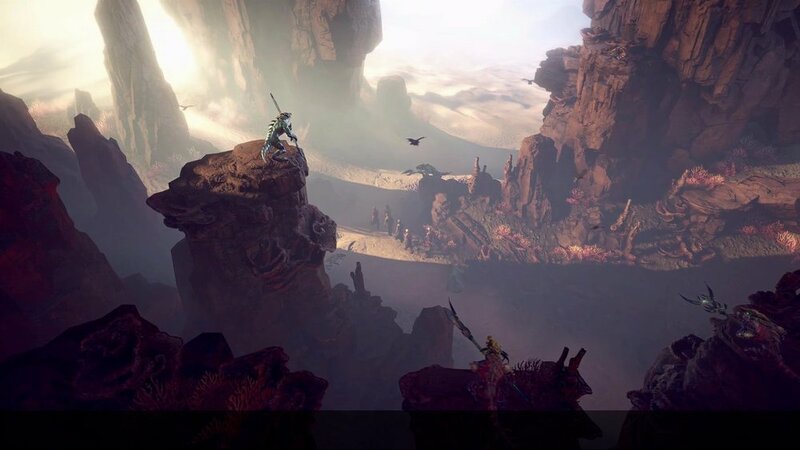 In fact, that last title is very relevant to this review as the same team that worked on that game has now given us Shadows: Awakening, a partial remaster and remake of Shadows: Heretic Kingdoms. Now, having said that, Awakening is far from your typical remaster as it contains a considerable amount of new content, new quests, new stories, and a built from the ground up change to its RPG systems and a full swap to the Unity Engine. To say that anything has remained the same isn’t doing this game any sort of justice as it feels like an entirely new experience. 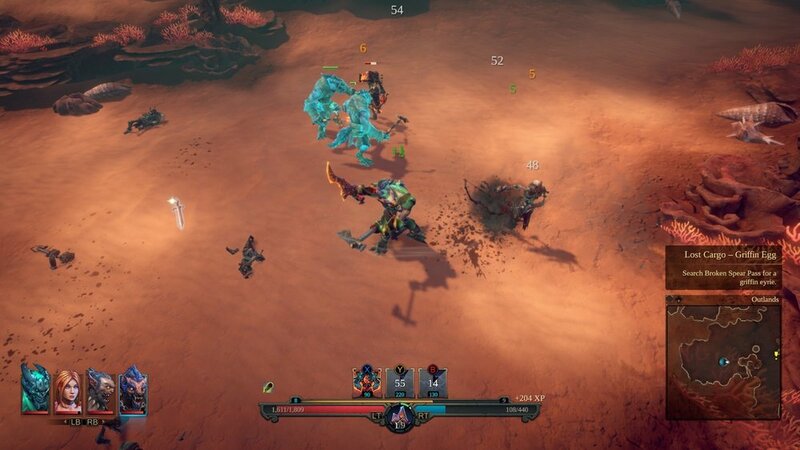 Shadows: Awakening is a very ambitious action RPG that has a huge cast of playable characters called puppets and they will be absorbed into a demon called the Devourer and used to complete a goal set forth by a mage named Krenze. While this secretive mage is behind this unconventional union of souls, his reasons for doing so are cryptic and it feels as if there is more to this partnership than he initially leads on. 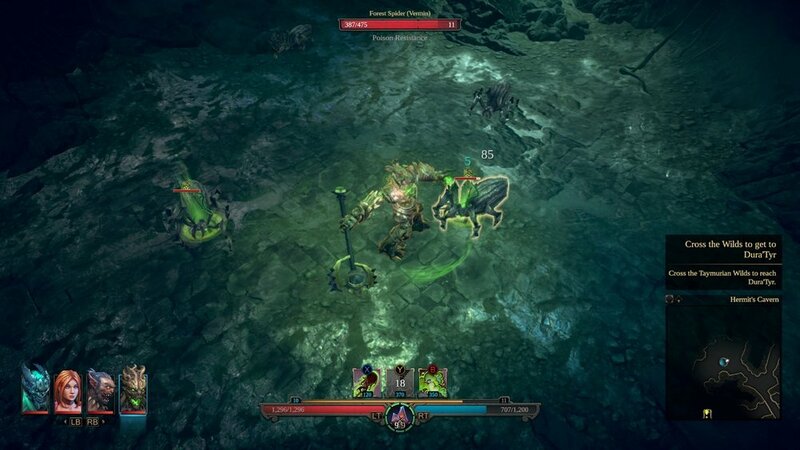 By absorbing souls, the Devourer can bring along three companions at a time and you are able to swap to each of them whenever you want. Where most action RPG’s have you sticking with a single class during the entire length of their story, Shadows: Awakening essentially gives you access to all three classes at anytime. Apart from swapping from puppet to puppet to attack with bows, swords, daggers, magic or whatever weapons or skills your team will utilize, this swapping also allows you to change realms at will. As the Devourer exists solely in the Shadow Realm, this allows you to traverse over paths only visible to him. While the same can be said for those in the Mortal Realm, the paths they have exclusive to them are far more rare. While in the Shadow Realm, you can also find solutions to puzzles that exist in different rooms or use the Devourer to eliminate enemies that are causing the dead to resurrect in the Mortal Realm or drop Shadow Realm shields on stronger foes. This swapping of realms is an interesting mechanic that is used to great effect and gives Shadows an identity all its own. My entire playthrough of the game is based around my time with Evia, one of three characters you bond with at the start of the game. Each of the first chosen have unique twists on their story and it is impossible to unlock every single puppet across a single playthrough. While I’ve jumped into the boots of each of the chosen, know that my experiences here are based solely around Evia’s complete narrative. While I don’t want to give too much away in regards to the twists and turns the story takes, Shadows: Awakening is built around the narrative of a team coming together to track down and stop a group of powerful people from doing a very bad thing. The story built around Shadows: Awakening is not exactly its strongest feature. While it can at times be entertaining, I found it bogged down with far too much lore that isn’t explained well enough without diving into the various notes and books you collect along the way. While that is something to look forward to should you be the type of gamer to read each and every note, it can certainly create a sluggish pace of a game should you stop and read everything that you come across. Had the game had these notes and books narrated like how Path of Exile explains most of its lore, then it could have been the best of both worlds. Each puppet you track down and add to your team will not only change the dynamic of how your team functions, or the cross chat between your roster, but it will bring with it new story changes and quests exclusive to them. This allows you to get at least three playthroughs out of the game should you want to take in each and every story offered. Evia’s story starts out based around the mysterious events surrounding her death and while it wavered in keeping my interest, I will say that I did not see the answer to that question unfolding as it did. In fact, it’s a twist I hold up there as one of the best I’ve seen in the industry. While you will start the game as the Devourer and one of the chosen, you will recruit the likes of a massive ironclad zombie, a bow-ready huntress, a humanoid wolf warrior, a skeleton assassin and more. There are 11 total puppets to recruit from after you’ve chosen from your starting three. As I mentioned before, you won’t be able to unlock each and every one during a single playthrough and the game will often present you with choices that will reward you with one or the other. Carissa, a warrior woman who resembles a Dark Elf, is one that you will automatically come across during the game and have included into the party regardless of your story choices. Each character has a class built around them and will vary in what kinds of weapons and armor you can equip to them. 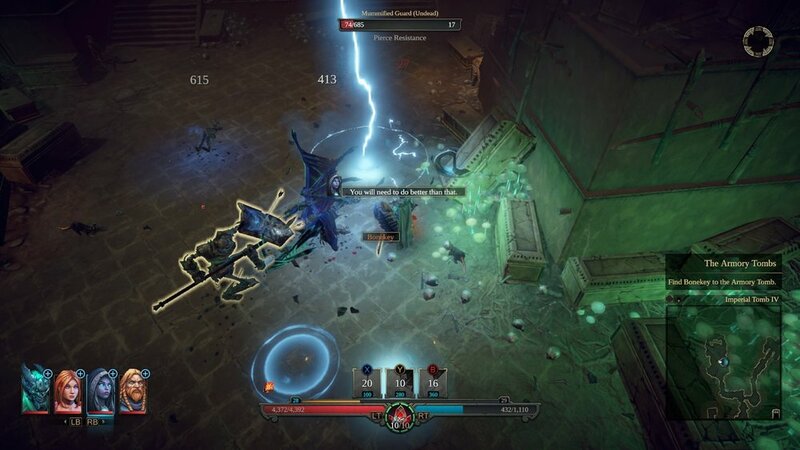 Shadows is a loot-based dungeon crawler that is always looking to have you change up your gear on the regular. I was actually surprised how often I was discovering new weapons and gear and even more surprised at how many different visual looks are available for each character. Given there are a total of 15 different characters to have in your party, that is an impressive amount of customization to be had. Each character can equip weapons based around their class and gear items such as helmets, chest armor, gloves, boots, rings and more. While not every character can wear every type of armor piece, there is quite a lot of min-maxing that you can do, depending on the difficulty, to get the most out of your hero. 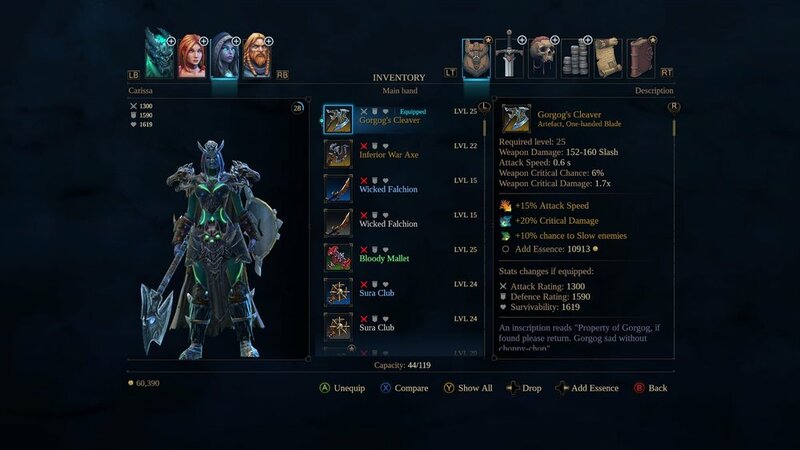 Combine that with an upgrade system called Essence, which allows you to add up to four special perks and bonuses to your gear like boosting elemental resistances and damage, and you have a very in-depth system that rewards the time you spend with it. With taking essentially four different characters into battle, you will have a total of 12 unique skills at your disposal. Skills are used based on the amount of mana you have and each come with their own respective cooldowns as well. Mana is earned back either from a regeneration system or through the use of crystals that can instead offer up health if you choose. You’ll unlock better crystals as you discover them that either hold more charges or return more mana or health back to you. Each of the 15 characters have 8 skills to put points into and level up. Evia’s skills are mostly based on fire, although she does have a pretty sweet tornado skill that can pick up smaller enemies and send them flying. Shadowhand, the skeleton assassin, has skills that can make him invisible, allowing him to strike from the shadows for additional damage. Even the Devourer himself has skills as well that have him either leeching health, attacking with tentacles, or boosting the damage dealt by his fellow puppets. These skills are mapped to the upper three face buttons as you will have a basic attack with the A or X buttons, depending on which platform you are using. This type of setup is only hampered by the fact that interaction and your basic attack are both equipped to the A/X buttons and I’ve had issues where my character with keep attacking instead of opening up a chest or interacting with a switch. 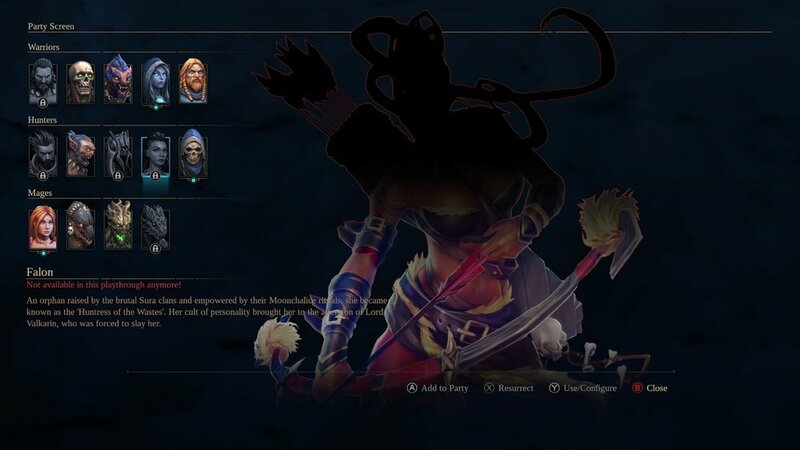 As you equip certain skills to each character, you can swap during the activation of a skill and have it remain active while you are controlling another character. This allows for skill fusions to occur and can create several interesting combinations to happen. While Shadows has a very been-then-done-that approach to how the game is played, the swapping mechanic featured here allows for some interesting variety and goes a long way to making the experience extremely satisfying. As you swap back and forth between each realm, both the Devourer and your mortal puppets will each have their own battles to contend with, with the odd enemy existing across both planes. Apart from putting points into your skills, you also have Talents and Attributes to tinker with as well. Attributes are your typical Strength, Agility, Endurance, and Willpower that are common aspects of the genre when leveling up. As you’ll recruit some characters well into the campaign, they will already come loaded with attribute points to put into whatever stats you want from them. Talents are passive skills like dealing additional damage to certain enemy types, picking up more silver upon a kill, or boosting the amount of health your character has. Some characters have access to unique Talents, but most of them share from the same overall pool. Talents spaces are unlocked every few levels until you reach max capacity at level 30. Shadows: Awakening doesn’t break the mold when it comes to how the genre is approached as exploring, side quests, and main quests are handled in the most typical way. Certain NPC’s will provide side quests that have you tracking down items, killing certain enemies, or other types of quests that you’ve done a hundred times before. Main quests are handled in the same way, but can change depending on which puppets you have access to. You can set markers to follow certain quests, but you will want to fast travel to most destinations as the markers can often have you running around in circles. 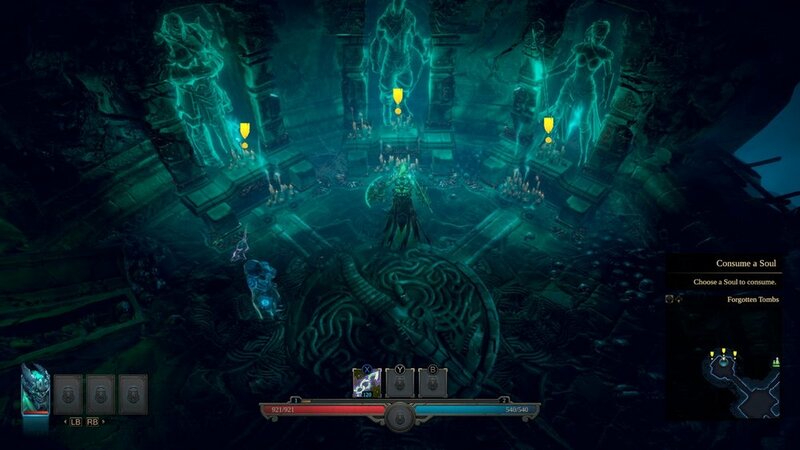 Shadows doesn’t offer any sort of open-world and instead follows the same tried and true dungeon crawling experience by exploring shadowed locations that start to unfog on the map as you explore them. This method allows areas to be revealed the closer you get to them and allows the game to hide several of its secrets, some of which can only be seen in the Shadow Realm. Spread out across the game are several puzzles that will require you to either swap back and forth between realms, or just be rather quick with some button presses. You’ll encounter platforms that have special markings on them in one realm and you will then have to walk on those areas without the markings present in the other realm. There are boulders to roll onto platform switches as well as switches to flip that keep a boulder rolling to its goal. In fact, even the final encounter has you rolling boulders in an effort to lower a particular force field. The puzzles are fun, but are rarely challenging as the answers are usually right in front of you. 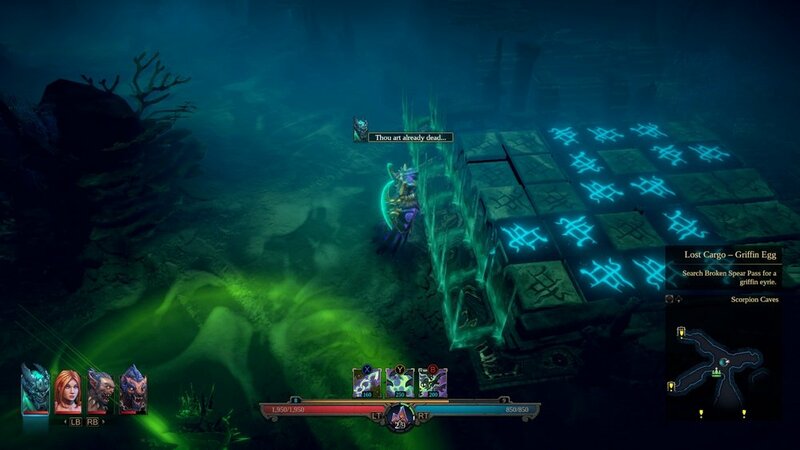 Game Farm has given us a very colorful dungeon crawler that doesn’t look too far off from what Blizzard aesthetically delivered with Diablo III. Locations here vary from standard hills and plains, swamps, old ruins, and burning city environments and many of them have some nice visual touches that make them truly stand out. The foggy underbelly of the streets of Kyallisar towards the end of the game stands out as my favorite environment and several other locations will feature a completely different look after some story sequences play out in the final moments of the campaign. The characters are more than serviceable with some stellar art design in not just their raw appearance, but in the armor sets they can be outfitted in. The overall menu structure here is fantastic and everything is incredibly easy to read, find, and affect in seconds, eliminating any type of confusion you normally find in games that have awful menu designs. 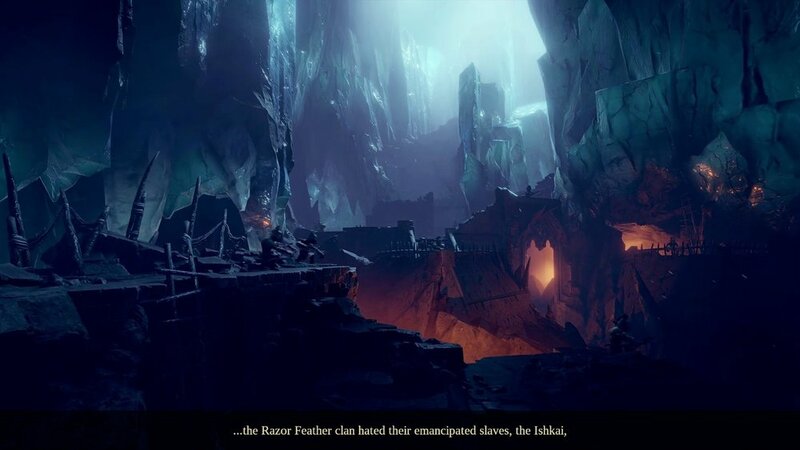 While the game doesn’t quite stand up visually to the likes of Path of Exile or Diablo III, Shadows: Awakening is made by a team of just 25 people, but you would never know that due to how good this game can look. The biggest issue I have with the title is the excessive backtracking you have to do during quests. There are countless examples where you will have to reach an objective on one end of the map and then have to backtrack to another location to then return back to that previous point. It happens at least a dozen times and while teleporting can help to a certain extent, there are countless areas where you won’t have access to use one. 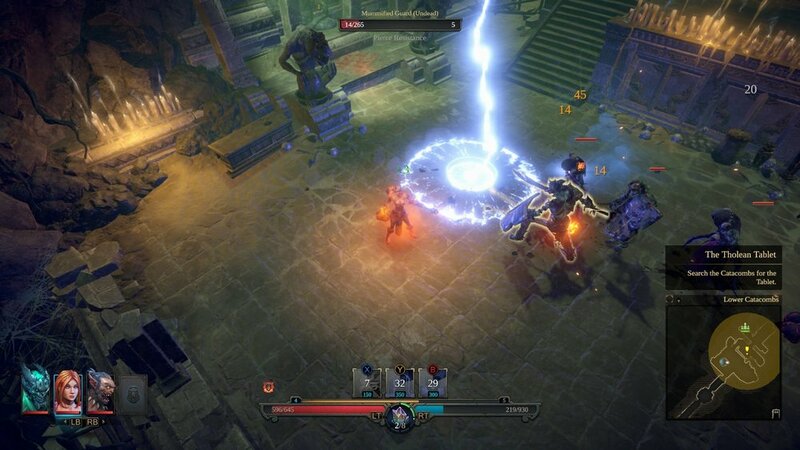 Shadow’s Awakening’s first few hours can paint it off as another generic Diablo clone, but once you start to build your team up and get a few interesting skills equipped, then it started to become something I couldn’t put down. I was a huge fan of Vikings: Wolves of Midgard and while I still believe that it is the better game here, Shadows certainly has a very interesting system behind its character swapping that I just haven’t seen used in the genre, at least to this effect. The story here is decent, but it tries to do far too much without really giving its lore time to breathe. The personal stories of each of the cast are far better handled and it is in those characters and the skills they possess that allows Shadows: Awakening to truly stand out and bare its soul, all 15 of them. A review copy was provided for the purpose of this review. All screenshots were taken on a Xbox One X.